Some of you might be wondering what exactly is screen mirroring. Well the process of screen mirroring is basically mirroring your laptop or your phone Screen to your TV without using any cables/Wires. There are two ways. Either you can use HDMI cable or any kind of a cable or you can also use Chromecast or similar devices. But there is another why that's completely free. You can do the screen mirroring by using a wireless connection and that's called screen mirroring. There are some devices that can support screen mirroring. But there are also some devices that can not support screen mirroring. To do the screen mirroring you need to be connected to same WiFi on both the devices. And both the devices should be connected to the same wi-fi network. You might be wondering is your TV supported? There are multiple ways you can check weather your TV is supported. Best way would be to call your brand support. Or just go into the TV options and search for Screen Mirroring. You can also check the i-manual of your TV that's a digital manual installed in your TV by your brand. Just go to the Index Tab in Maunal and search for wireless settings or maybe network settings and you should be able to find the screen mirroring under those tabs. Read This Article for More Info on “Is your TV Supported”? Once you find out that your TV is supported. Now you might be wondering is your phone or your laptop is supported? know one thing about laptops is that every laptop in the world if it has WiFi then that means it can support screen mirroring. On the other hand, Phones are bit different compared to the laptops. There are some devices that support screen mirroring but there’re few which don’t support Screen Mirroring. Due to old hardware or maybe old software. But the simple way you can check your phone is to, go to the settings go to the more section under WiFi network settings. There you should be able to see something like Screen Mirroring or Mira Cast. If you’re using samsung device you should be able to find the option under the "Extended Notification Panel". This is just a simple information if you need to know more about those topic listed above, you can either visit my YouTube channel or read other articles here on this website. Do you have Screen Mirroring in your TV? The most frequent question that you ask yourself before even doing the screen mirroring is that whether your TV is supported. 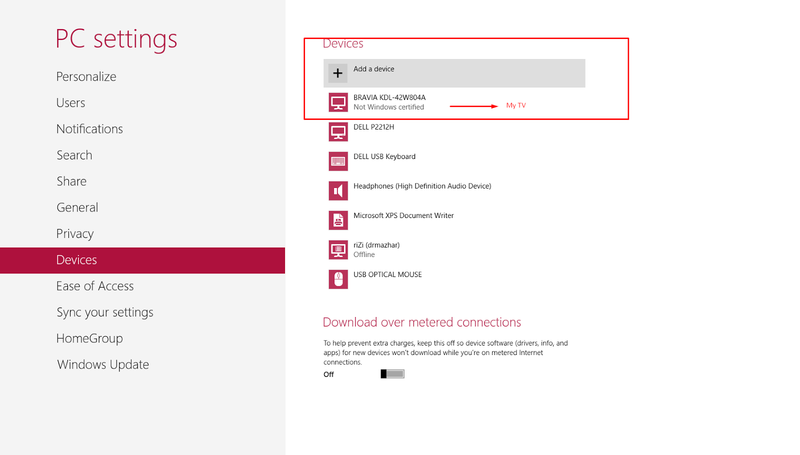 There are multiple ways you can check whether your TV is supported or not. The most simple and the easiest way to check if your TV has screen mirroring is to call your support of your TV brand. And ask for the specific feature the you are looking for which is a screen mirroring here. You can tell them your TV model and I'm pretty sure they will answer you. Other ways to check is going online. You can check for specific moral on sony’s official website and then once you got your TV just goto Features TAB. You can go to the main menu and goto the CONNECTED DEVICES Tab on your TV. There should be screen mirroring for sony TV's. For the Global TVs the method is that you can go to the i-manual of your TV. The i-manual is a digital manual for your TV. Open the digital manual and go to the network settings. Under the network settings look for the screen mirroring option. Or you can also go to the wireless settings since the screen mirroring feature support or should I say feature WiFi Hotspot. Because the Wi-Fi is actually needed to start the Screen Mirroring. That's why you need to look for the screen mirroring under network settings. Or maybe wireless settings, depending on what kind of a TV Brand are you using. If you are using Sony TV (Like I do) you can just go to the main menu. And look for the TAB called “Connected Devices”. This TAB is mostly used if you’ve connected external USBs, HDMI Cables or even Loud Spears. That’s where you’ll find the Screen Mirroring in Sony TVs. If you are using LG TV you can go to the settings under the WiFi settings. And there should be a Screen Mirroring Feature. But LG don’t really call it Screen Mirroring. Rather LG call it Mira Cast. It’s exactly the same just the name is different. If you’re using Samsung TV. I suggest you to go to the settings under the settings there should be Screen Mirroring. Don go to the any other options just under settings or you can just click “Option” on your remote control. And look for Picture or Devices Option. In there you’ll be able to find the Screen Mirroring Feature on Samsung TVs. 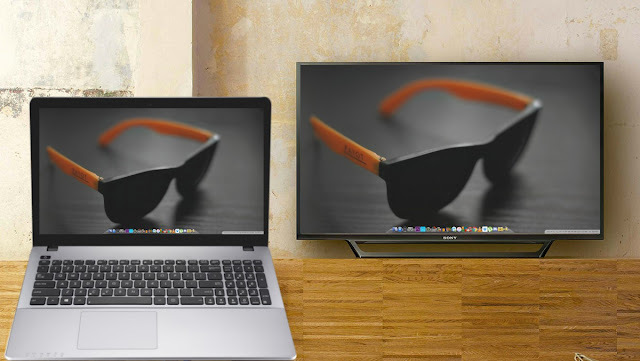 In this article I’ll teach You how to connect your laptop screen to your TV without using any cables. Now there are two ways you can do this. Either by using a cable or you can go with the wireless option. But in the wireless option you need to have a Wi-Fi connection. It doesn't matter if the Wi-Fi connection is connected to the Internet or not. To make the screen mirroring successful. We need to make sure that both the laptop and the TV is connected to the same WiFi network. Otherwise it won’t work. To start things off you don't need to install or download any additional program. The screen mirroring feature is not in the hardware but it’s in the software. It comes pre-installed in Windows 10, win8 or 8.1 not sure about Windows 7. Now once your laptop and your TV is connected to the same WiFi network. Everything is ready to go. Now on your TV turn on the Wi-Fi. Find the screen mirroring feature in your TV. If you have no idea where to find it. You can watch my videos on my YouTube channel. 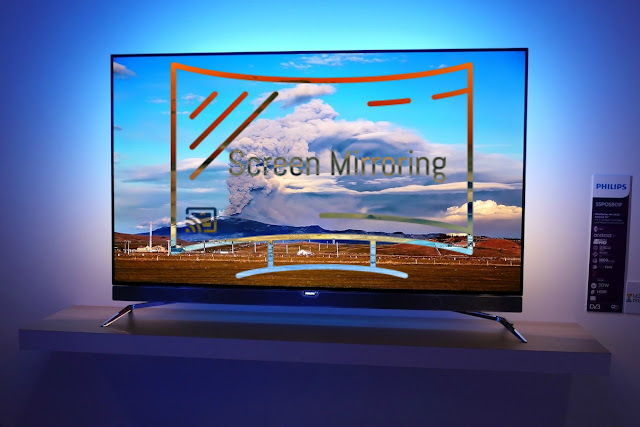 Or you can also read my previous Articles on "Is your TV Supported to Screen Mirroring". Once you find the option just tap on it and if the wi-fi on your TV is running then the Screen Mirroring Option should be enabled on your TV. Once it's enabled. It will allow us to connect our laptop to our TV via hot-spot. Once the screen feature is enabled. Time to switch to our computer. To enable and make this mirroring successful. We need to do it right by the laptop too. Now, just goto the settings, goto the Device TAB. In the Device TAB look for the Connected Device. You should be seeing Connected devices like "Printer", "USBs". Just click on "Add a New Device".It'll automatically start the search for our TV. Once you see it's your TV in the search TAB just TAP on it. It'll ask for your permission on your TV. Just hit accept and it should take around 2-3 mins to enable the connect. If you're having Audio Issue, just goto Audio Tab and disable the current LAPTOP default speakers and enable the TV SPEAKERS. Screen mirroring on Samsung is comparatively easy compared to other Android Phones. The feature called Wi-Fi direct option was released by Google in Android 4.0. But the Samsung Galaxy S2 was released before Android 4.0 and it has WiFi direct option built-in. Any Samsung phone above 4.0 or any Samsung phone greater or equal to Samsung Galaxy S2 can actually support screen mirroring. 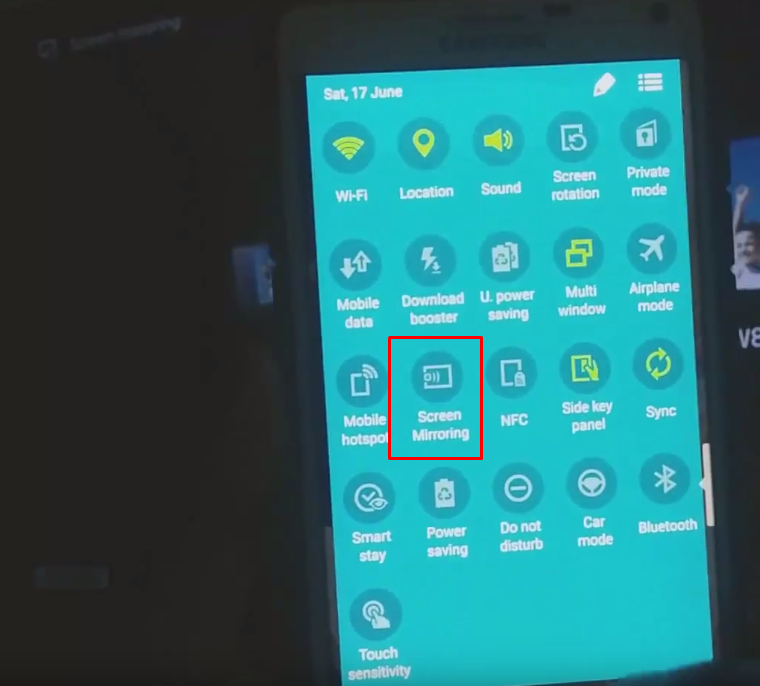 The screen mirroring on Samsung devices is fairly simple. Compared to the any other smart-phone in the market. You don't need to download any extra additional softwares to screen mirror the Samsung phone. But you do need to open WiFi connection on your TV. But it doesn't matter that you have Internet connection or not. All we need is just a simple Wi-Fi connection you can also get a Wi-Fi connection by opening a Hotspot on your phone. Before connecting your Samsung phone to TV just make sure your phone and your TV is connected to your WiFi connection. It's mandatory that both the phone and TV are connected to the same WiFi network. Now the phone I'll be using is the Samsung Galaxy Note 4. It's pretty old phone compared to the new latest Samsung Galaxy S8 or Note 8 but it can actually do the job just as well as any latest Samsung phone can do. Once everything is done and ready. You need to connect your TV to WiFi same as your phone is connected to. Now on your TV find the option called screen mirroring. It could be under network settings or under wireless settings depends on your TV. Or what brand are you using right now I am using Sony Bravia. 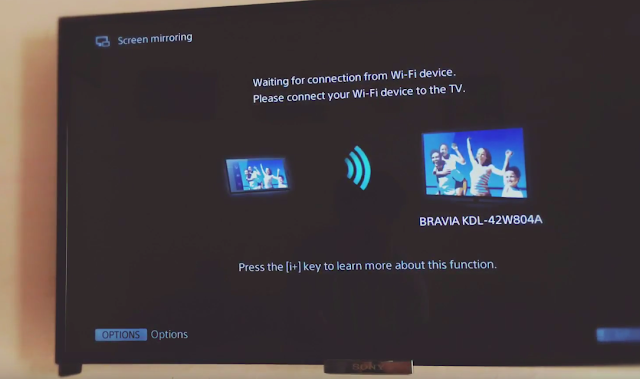 In Sony Bravia TV you can easily look at the screen mirroring option in the main menu under the connected devices. Once you find the option just tap on it and it will enable this Screen Mirroring. Now take out your cell phone and bring down the notification panel by swiping down from the top of your phone using two fingers. It’ll drop the additional notification panel in there you can look at the screen mirroring option. It should be at the bottom as you can see in the picture below. Once you find the option. Just tap on it and it will automatically search for your television. Now if the screen mirroring option is enabled on your TV then your phone should be able to pick up the TV running in the background. But if the Screen Mirroring is not enabled on your TV then it won't Catch your TV. Once you click on your TV name it will automatically connect your Samsung phone to your TV. Once connected you should be able to see your phone wirelessly on your TV without using any kind of wires. Now you can enjoy gaming watching movies and much more. 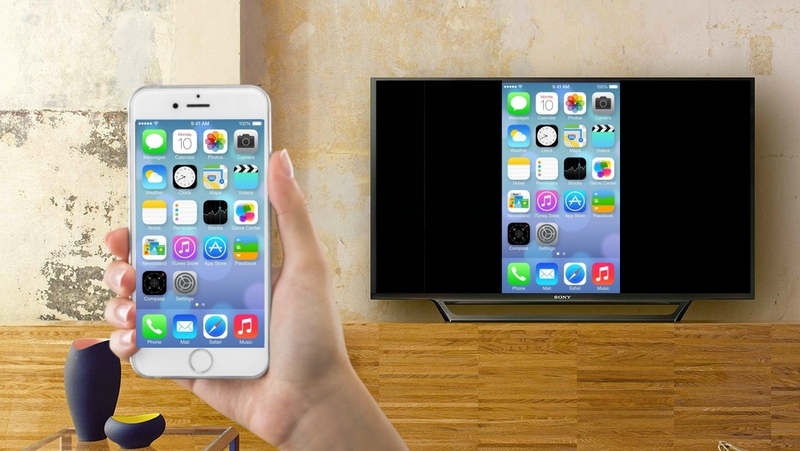 In this article I'll teach you how you can mirror your iPhone Screen to any TV in the world. It doesn't have to be Apple TV. Problem is that every iPhone or any Apple product support screen mirroring with only and only Apple TV. Which we humans don't use. So that's why I have to make this article to help you people mirror your iPhone Screen to any non Apple TV. To do this trick. We need to make our iPhone believe that there is an AppleTV instead of Sony TV. It's fairly simple trick. All you gotta do is to download a certain application on Widows or MAC. To make iPhone into believing that there is an actual Apple TV instead of Sony or whatever TV brand you are using. For the sake of this article I'll be using Sony Bravia 4K and 3D TV and the phone I'll be using is the iPhone 6s plus updated to IOS 10.3.3. To make this screen mirroring successful. We need to have an actual laptop or desktop PC. It doesn't matter what you have, but I'll be using laptop since it's more feasible and flexible. All you gotta do is to connect your laptop screen to your TV. Well you can do this by using two methods. Either you can use physical HDMI, DVI or even VGA cable if your TV supports them. Or you can also go with the wireless option. You can do the screen mirroring without using any cables with the help of Wi-Fi. More articles can be found in this website. I'll be using HDMI cables to quick things up. You can also download it for Mac. If you are using but assuming everybody is using Windows so download it for windows it's completely free. Once it’s downloaded you need to install it. And after installing is complete launch it. It'll ask you to buy it, as I said before you don't have to worry about anything it's free. 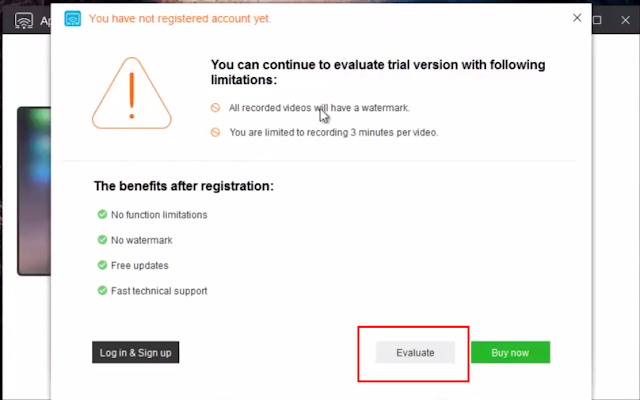 Just click evaluate and just make sure that the applications indicates that it's ready. Screen Mirroring - What's it? Subscribe now to get the chance to see exclusive content first!